As I mentioned in my last post, a new Barna survey claims that two thirds of American adults believe in the literal truth of the stories in the Bible, and concludes that "people believe that their personal trust" in the biblical God "is warranted" from these stories. But of course the entire survey was set up to produce the desired result. The selected stories were the safe and familiar ones found in children's Bibles (and are the only ones that most adults are familiar with today). I wonder what the result would be if the Bible stories were selected at random. What would happen, for example, if the following six stories were selected? 1) God kills every Egyptian firstborn baby. 2) God sends fiery serpents to bite and kill his people (for complaining). 3) Moses commands his soldiers to kill every boy, woman, and female child (except for the virgins). 4) God orders the Israelites to kill every Amalekite man, woman, and child. 5) David buys a wife with 200 Philistine foreskins. 6) God kills husband and wife for not giving all their money to Peter. Would people believe in the literal truth of these stories? Would they still "believe that their personal trust" in the biblical God was "warranted" by them? Oh boy, a new Barna survey is out! This one is trying to find out if Americans still believe those cute Bible stories they were taught as kids. And, not too surprisingly, most (about 2/3) still do. From the survey, the Barna group concluded that "these and other Bible stories inspire people to believe that their personal trust in that powerful God is warranted. Although some people may dismiss such writings as fairy tales for children, the data indicate that the typical American has adopted these accounts as the foundation of a valued faith in God." Okay. But what I'd like to know is this: Why did Barna choose these six stories for the survey? 1) They are the stories that most people are familiar with. 2) They are stories that most people can stomach. The stories are familiar not because most people have read them, but because they were read to them when they were children (and very few have read them since). The text and illustrations made it all seem so appealing, comforting, and certain. They were included in the Barna survey because when it comes to religion, familiarity breeds, not contempt, but acceptance and belief. And belief was what the Barna survey was trying to find. Okay, this "New Rule" is a bit old (It was on Bill Maher's 21 Sept 2007 Real Time show), but it's a good rule to follow. New rule: just because the constitution doesn't have a religious test for office, doesn't mean I can't. Maybe a president who didn't believe our soldiers were going to heaven might be a little less willing to get them killed. Jesus, I love to hear Pastor Deacon Fred preach! Here are some excerpts. When the Lord gets a bee in his bonnet about something, he turns into a killing machine. 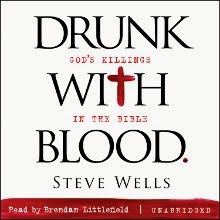 Now anyone familiar with this wonderful book [the Bible] will know that if there's one thing that the Lord enjoys more than making free booze at wedding parties, it is killing. Yes that's right. God wants us to constitutionally ban abortion, but he's not above using it to get back at folks that tick him off. We have an invisible friend on our side who is more powerful and diabolical than this Mohammad fella.